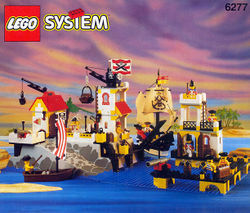 6277 Imperial Trading Post is a trading post which included several cannons, a row boat and a ship with two sails. The set also had one winch crane and a static string crane. Included are two Imperial Guard Minifigures, one lieutenant and one general the set included four pirates and a merchant. This set is the largest Imperial Guards set, and features a merchant ship, dock and fort. Facts about "6277 Imperial Trading Post"